First off, a huge thank you to everyone who made and sent their Danjon scale estimate of the totally-eclipsed Moon’s brightness to Dr. Richard Keen, University of Colorado atmospheric scientist. Your data were crucial to his study of how aerosols in Earth’s atmosphere and other factors influence the Moon’s appearance. Grateful for your help, Keen received a total of 28 observations from 7 different countries. Using the Danjon information and estimates of the Moon’s brightness using the reverse binocular method, Keen crunched the data and concluded that the Moon was about 0.6 L (Danjon) units darker than expected and 0.4 magnitude dimmer, a brightness reduction of 33%. This agrees well with my own observation and possibly yours, too. No wonder so many stars sparkled near the Moon that night. I think it’s safe to say, most of us expected a normal or even bright totality. So why was it dark? Several factors were at play — one to do with the Moon’s location in Earth’s shadow, the other with a volcanic eruption and a third with long-term, manmade pollution. 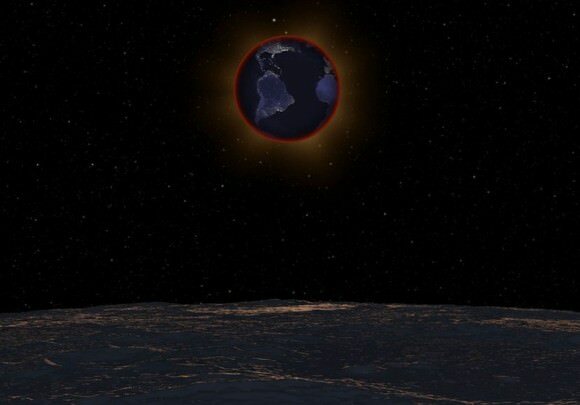 You’ll recall that the eclipse occurred during lunar perigee, when the Moon swings closest to Earth in its 27-day orbit. Being closer, it also tracked deeper into Earth’s umbra or inner shadow which narrows the farther back of the planet it goes. An apogean Moon (farthest from Earth) passes through a more tapered cone of darkness closer to the penumbra, where sunlight mixes with shadow. A Moon nearer Earth would find the umbral shadow roomier with the light-leaking penumbra further off in the distance. While much of the debris blasted into the stratosphere made for colorful sunsets in the southern hemisphere, some of that material has likely made its way to the northern hemisphere. Albers has noticed an increase in yellow and purple sunsets in his home town of Boulder in recent months, telltale signs of volcanic spew at play. Forest fires that raged across the western states and Canadian provinces all spring and summer may also have contributed. Most of that smoke usually stays in the lower part of the atmosphere, but some may have found its way to the stratosphere, the very layer responsible for transmitting most of the sunlight that falls into Earth’s shadow and colors the moon. Sunlight has to pass through these light-absorbing minerals and chemicals on its way through the atmosphere and into Earth’s shadow. Less light means a darker moon during total eclipse. Coincidentally, much of the totally eclipsed Moon passed through the southern half of the umbra which “increased the effectiveness of the Calbuco aerosols (which are still more concentrated in the southern hemisphere than the northern) at dimming the light within the umbra,” writes Keen. It also so happened that the darkest part of the moon coincided with two vast, dark volcanic plains called Oceanus Procellarum (Ocean of Storms) and Mare Imbrium, artificially enhancing the overall gloom over the northern half of the Moon. Finally, the human hand may also have played a role in lunar color and brightness. The burning of coal and oil has caused a gradual increase in the amount of human-made sulfate aerosols in the atmosphere since the start of the industrial revolution. According to NASA, at current production levels, human-made sulfate aerosols are believed to outweigh the naturally produced sulfate aerosols. No surprise that the concentration of aerosols is highest in the northern hemisphere where most industrial activity is found. Isn’t it fascinating that one blood-red Moon can tell us so much about the air we breathe? Thank you again for your participation!